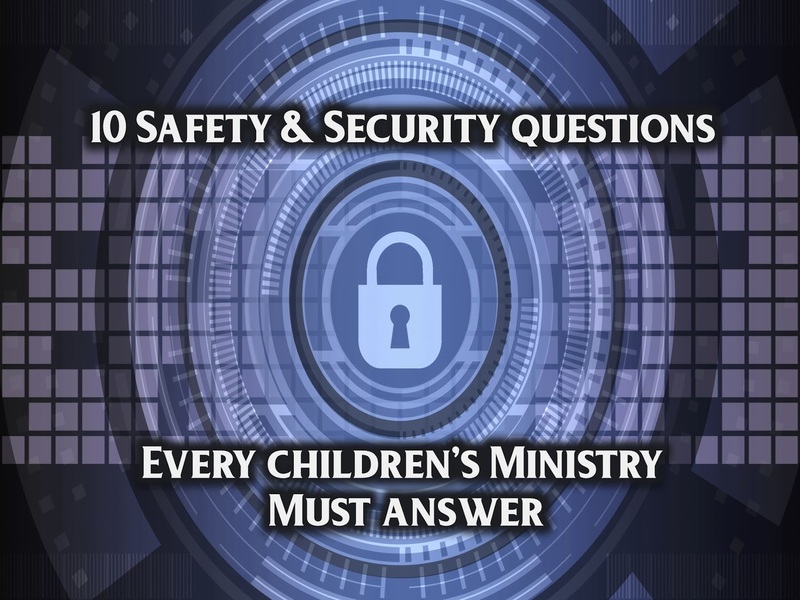 One of the most important aspects of children's ministry is safety and security. This has escalated in recent years due to the shootings and abuse that has taken place in schools, colleges, churches, movie theaters, restaurants, concerts and other public places. Our new reality is it can happen at anytime and at any place. From big cities to small towns, we must be prepared. In fact, if you want your ministry to grow and reach families, like never before, you must have a solid safety and security plan in place to prevent violence and abuse from happening. Parents want to know that their child will be safe in your ministry. If they feel like it is not a safe place, they will not return. An effective safety and security plan doesn't happen by accident. It is created by a team of people who are diligent to protect children and families at their church. If you don't currently have a safety and security plan in place or if you have one and you want to improve it, here are 10 questions you can sit down with your team and work through. 2. Is there ever a time when someone is alone with a child? You can run background checks, but without having the "never alone" policy, you are in danger of abuse happening. One of the leading churches in the country is going through an abuse case right now. A volunteer abused at least 2 children. The abuser had no past criminal history on his background check. But if the "never alone" policy had been followed, the abuse could have been avoided. 3. Do we have a check-in / check-out system in place? 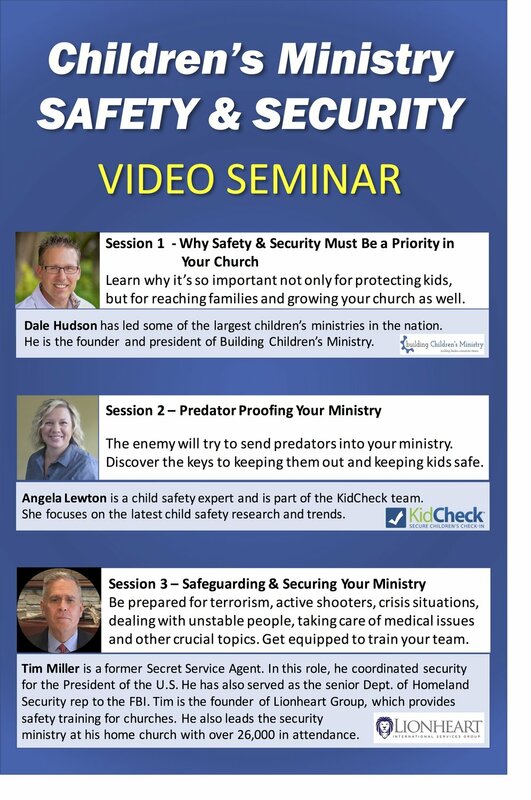 This is another must have if you want to keep kids and parents safe in your ministry. The plan should be followed rigorously. This means everyone must have a matching tag before the child is released to them. No exceptions. Some churches have a policy that only people with an approved, matching tag are allowed into the children's area for drop-off and pick-up. This is a good idea and will strengthen your plan. One of the best systems for check-in and check-out is KidCheck. You can get more information by clicking on their banner that is right beside this post. 4. Do we lock down the children's area once service has started? Access to the children's area should be locked down once service starts. This is to create a barrier against an active shooter. "Is there anything in your past that would prevent you from serving in children's ministry?" "Have you ever been accused or convicted of abusing a child?" 6. Do we have windows in every classroom? No class or program should happen without a window in the room that allows people to be able to see and monitor the class from the hallway. 7. Do we have an active shooter plan? What would happen if an active shooter targeted our church? Do all of our team members know what to do? 8. Do we have a security team that is trained in what to do? Best case scenario is to have a police officer in uniform present in the children's hallway or entrance doors. This will not frighten parents. In fact, they will breathe a sigh of relief. In addition to having a uniformed officer present, you want to have a volunteer security team that works closely with the police officer to keep the area safe. The volunteer security team should be trained to assist children and families when an issue arises. 9. Are our volunteers clearly identified? Approved volunteers should be identified with a shirt or name tag or lanyard, etc. This helps you quickly identify everyone who should or should not be in the classroom. 10. Do we have an evacuation plan for fire, tornadoes, earthquakes, etc.? Are you ready and prepared, if you had a fire alert? Where would the kids be taken? How would parents pick them up? All of these type of questions should be answered clearly and volunteers should know what to do. It is also a good idea to try an evacuation drill occasionally. Your turn. What other safety and security measures should churches have in place? What is missing? What questions do you have? Share your thoughts with us in the comment section below. p.s. Another great resource you can access for your ministry is our Safety and Security Training. This video seminar comes as an instant download that you and your team can watch. Below is more information and you can get it today for only $14.99 at this link.